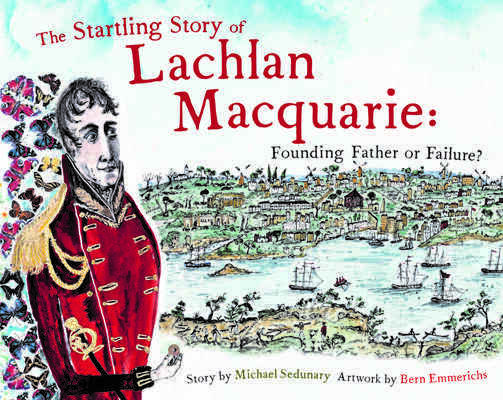 The story of Lachlan Macquarie is an important story in the history of modern Australia that has been largely lost to the current generation of school children. Whilst we’ve all seen many things named after Macquarie, few realise the important role he played in the Australia we know today. Lachlan Macquarie’s gravestone bears the inscription, ‘Father of Australia’. That’s quite a claim, but is this a title Macquarie really deserves? He is rightly celebrated for his inspired infrastructure building and his enlightened treatment of convicts and emancipists, but his treatment of the Indigenous population was far from enlightened. And then there was the Bigge report to the British Parliament that was scathing in its criticism of Macquarie’s governorship, on the grounds that he was far too ‘democratic’. So how are we to think of this towering figure of Australian history: founding father or failure? Michael Sedunary’s narrative is both informative and interactive; he poses questions and points out modern parallels. Bern Emmerichs’ extraordinary illustrations capture the lively naïveté of the painting and drawings of that time with the sophisticated, clever techniques of illustration today. The illustrations all painted on large ceramic tiles that are individually fired between each layer of colour.